For more information about Oak Hill Cemetery see pages 232 and 233 in the book “Holmes County to 1985” (c) 1985 Holmes County History Book Committee. Thank you for commenting, Josie! We’re glad you found the resources provided by our cemetery website helpful! We have plans to continue adding content as time allows, so please, stop back often! Thanks, Sharen, for your kind comments! We’re glad you found the videos and information useful. Please stop back often as we hope to keep adding information that people will find helpful as they “dig up” their past! Has anyone asked this question: You say in Part III that Dr. A. A. Crump was a founder of the Oak Hill Cemetery and that Dr. Crump was born in 1850. But you also say the cemetery was founded in 1848 and the first burial was in 1862. So, that leaves Dr. Crump as a founder of the cemetery at worst, before he was born (1850) or at best at about 12 years of age (1862)? Possibly you got the wrong Dr. Crump? Thank you for your comment! For clarification, the Oak Hill Cemetery Association was formed on June 20, 1862 as part of a February 24, 1848 Act of the Ohio General Assembly. In addition to providing viewers with a look at Oak Hill Cemetery, we also wanted to feature the members of the original Oak Hill Cemetery committee in our videos. Previous visits to the cemetery were unsuccessful in finding Dr. Crump’s tombstone, so we were very excited when we unexpectedly came upon the stone of a Dr. A.A. Crump during our final filming at Oak Hill. Upon further investigation, we found that there was, indeed, two Dr. Crumps – Junior and Senior. The stone we found was of Dr. A.A. Crump, Jr., who was born in 1850, and, as you pointed out, could not have been the same Crump who was part of the Oak Hill Cemetery committee. It was Dr. A.A. Crump, Sr., born in 1821, who was one of the original founding members. Alas, his tombstone still eludes us. As time allows, we will continue our search for Dr. A.A. Crump, Sr’s tombstone. Thank you, once again, for your observation and keeping the Grave Ladies on their toes! What is the full address for the Oak Hill Cemetery? I have 8 family members barried there and I wanted to come visit. We could not find a complete address for Oak Hill Cemetery. However, it is located on Port Washington Road which is just off of State Route 39, across from Millersburg Elementary School. Below is a Google Map link that shows the location of the cemetery. Thanks! That really helps! I have another question. I had a relative that went to the cemetery in the 90’s and found my Grandmother’s father’s grave site – Charles Croskey. He says that the grave is now unmarked as it was just a plastic grave marker. How do I go about finding it now? He had a sister in the same boat – Hazel Croskey. We’re glad you found the directions helpful! I would suggest contacting the Village of Millersburg at 330-674-1886. They are in charge of the cemetery and may either have the plot map for the cemetery or can put you in contact with the person responsible for keeping cemetery plot records. In reference to an address, the only one I ever knew was for the house that used to be there. I believe it was 1 Cemetery Drive. My family lived there in the early 70’s when my dad was caretaker. The garage is the only thing left now. (And the yard/house area seems so much smaller now!) Seems odd that the cemetery didn’t have it’s own address doesn’t it? We did a Google search as well as checked the local Business White Pages and Yellow pages, but found no address for Oak Hill Cemetery in Millersburg. It does seem odd that it doesn’t have a physical address. 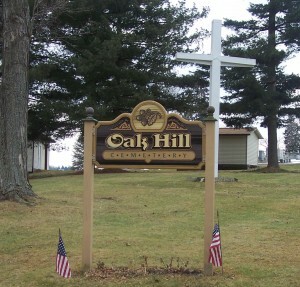 If anyone finds an address for Oak Hill, please leave a comment so we can share that information with others. On the cemetery site, look for the “township” tab on the bar. Click on Hardy Township. Scroll to the bottom of the page, and you will find tombstone inscriptions for Oak Hill. to one in Killbuck and then again in Millersburg. There are 3 Oak Hill cemeteries located in Holmes County. There is an Oak Hill Cemetery located in Millersburg (located near the library), one in Killbuck and another located in Mechanic Township in Holmes County. Records for all 3 cemeteries can be found on this website. Good luck in your search. I am having touble find cemeteries in Homes County, Ohio with indexes. Looking for the John & Alice Graham familes and son Arthur and Melissa Graham. Would there be any published family histories available? Your ancestors are in the Elliott Cemetery in Mechanics Township. Thanks to your site, I may have found the elusive parents of my 4th great grandfather! Is there any way to see the original records for the cemetery? I’m currently researching Samuel Lemmon (d. 1844), who is listed along with Thomas, Margaret, John K., and William Lemmon on the Washington Cowen monument.